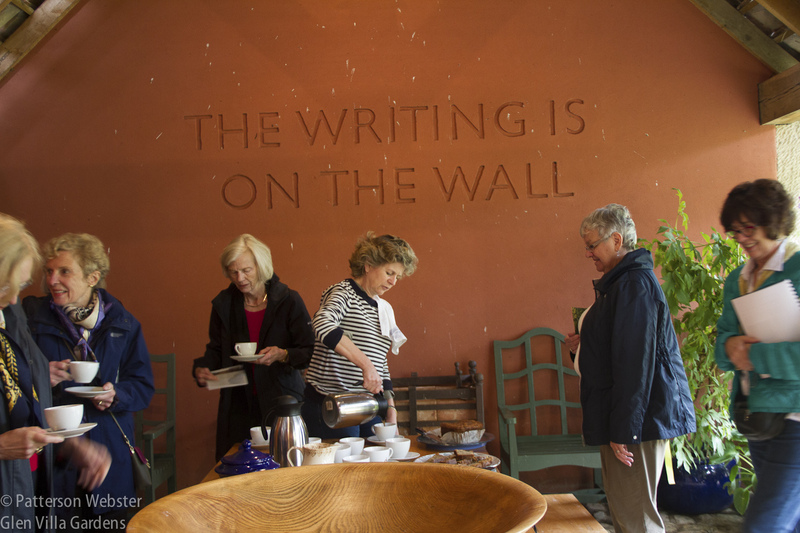 The writing is on the wall — not metaphorically but literally. This latest work of art is a collaboration with my friend and neighbour John Hay. He and I previously collaborated on a mosaic map of Glen Villa and a giant turtle that sits in the Upper Field. More significantly, though, the project is a departure for me. As my granddaughter pointed out, it is the first piece I’ve conceived that doesn’t relate to nature or natural materials in one way or another. Using neon makes it different — jazzier and more urban in tone. Neon signs are rare now, replaced by plastic signs lit from behind. To make the sign for Glen Villa, John called on the skills of a local sign maker, one of a very few who is still able to do the work, who bent glass tubes into the appropriate shapes, inserted a powder into the tubes and then added a gas that fixed the powder to the glass. An electrician made the necessary connections and voila! a neon sign. Neon shows up during the day but is flashier by night. When the idea for this project came to me, I knew immediately that I wanted the words to be up in lights, either in LED strip lights or neon. I chose neon because it coloured the world I grew up in. It lit up the streets at night, advertising diners like Bill’s Barbecue and White Tower and department stores like Miller & Rhoads and Thalhimers. It flashed out the words which sold every product that a 1950s world desired, including — oddly enough — Sauers Vanilla. That sign fascinated me as a child because it was animated — the word vanilla appeared letter by letter while a chef in a tall white hat added vanilla to his batter, drop by drop. I chose neon as well because it lightened up the message. The words are clichéd now but they have a long history whose meaning has always been negative. 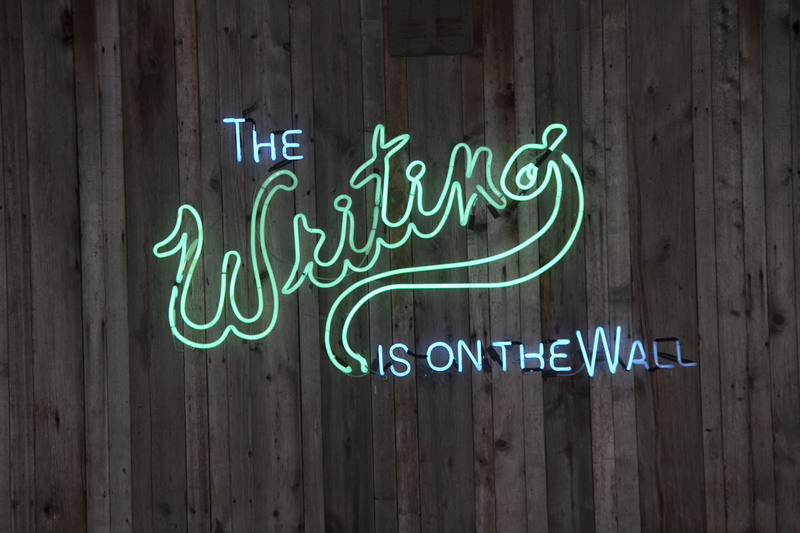 If the writing is on the wall, something bad is going to happen, and that something is inevitable. As told in the Book of Daniel, the phrase dates back to 5-3 BCE, when a disembodied hand appeared during a feast given by the ruler Belshazzar, writing mene, mene, tekel, parsin on the wall. Daniel interpreted the words as a warning to the king, and that very night Belshazzar was killed and his kingdom divided between the Medes and the Persians. Or so the story goes. 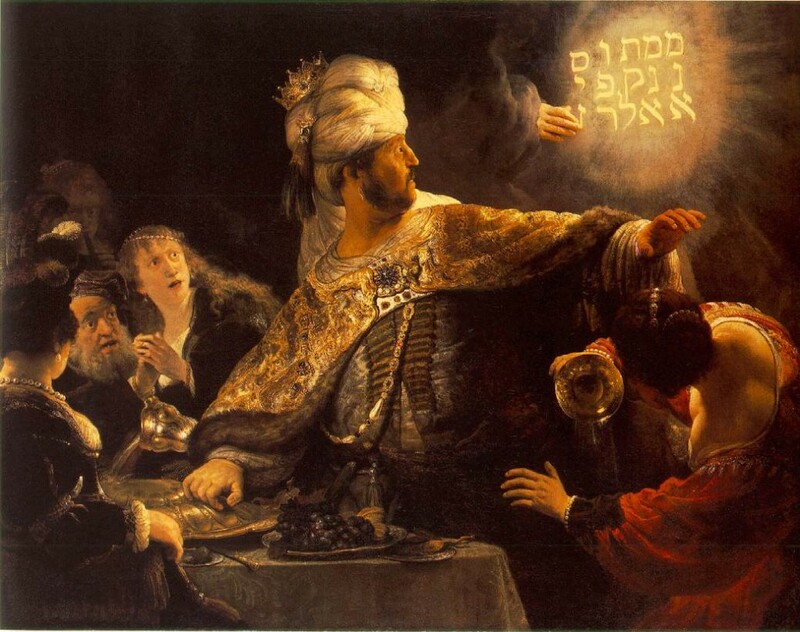 Belshazzar’s Feast, by Rembrandt. The story features in poems by Byron and Heine and in music by William Walton, Handel and others. Johnny Cash told Belshazzar it was getting late, since he was weighed in the balance and found wanting. It’s a great song, take a listen. I didn’t put the writing on the wall to warn anyone. Far from it. The idea simply appealed to my sense of humour. It made me laugh. But I also knew that the installation was more than a joke. The sign is personal for me as well since it continues my use words in the landscape. 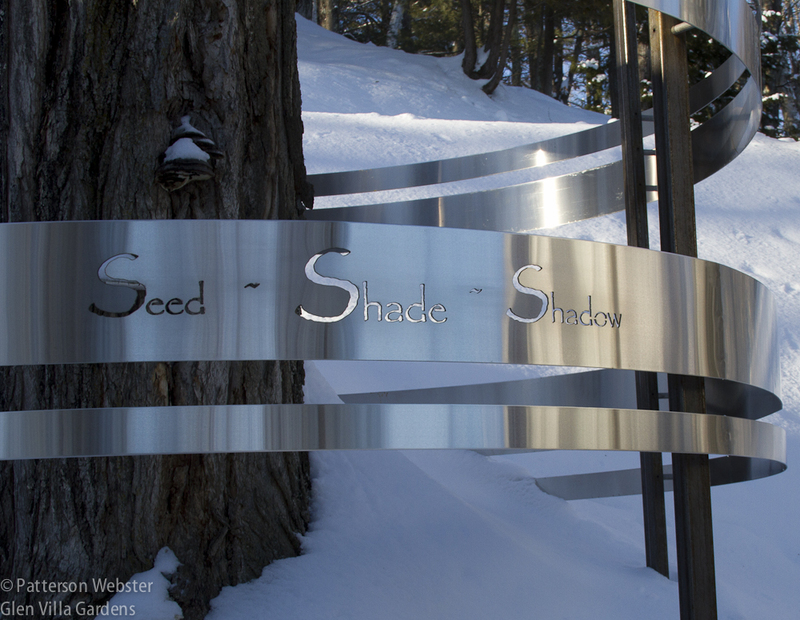 Tree Rings uses three words, Seed, Shade, Shadow, to tell the life story of a tree. 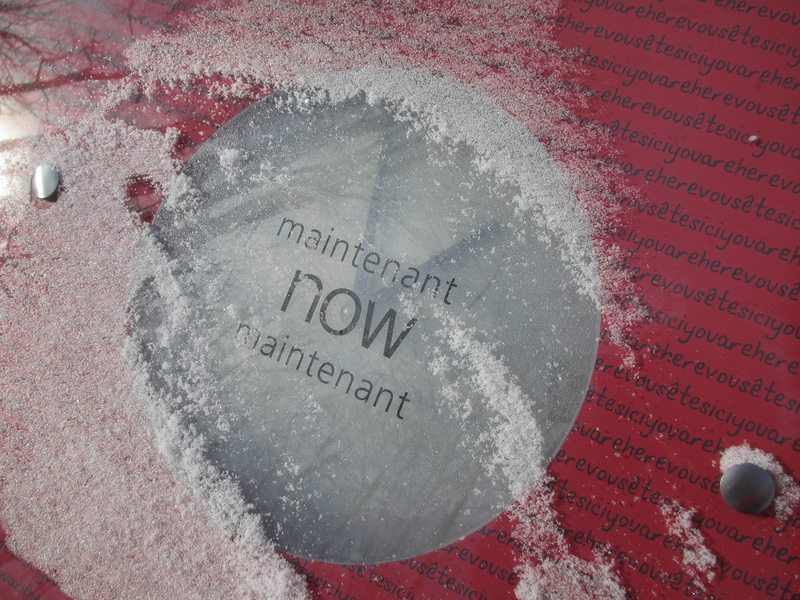 I used words for the first time at Glen Villa in an installation called In Transit/En Route. 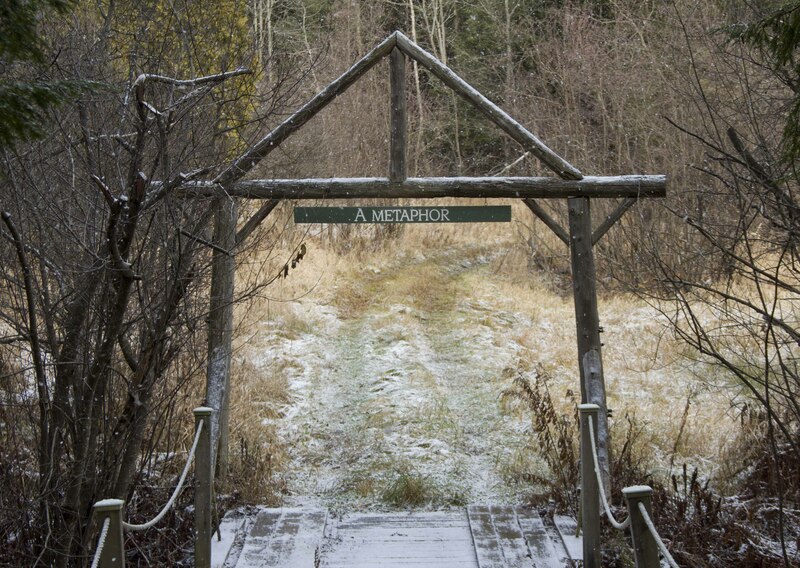 This sign appears in the centre of the Sundial Clearing, the final resting spot on the trail that makes up this woodland installation. 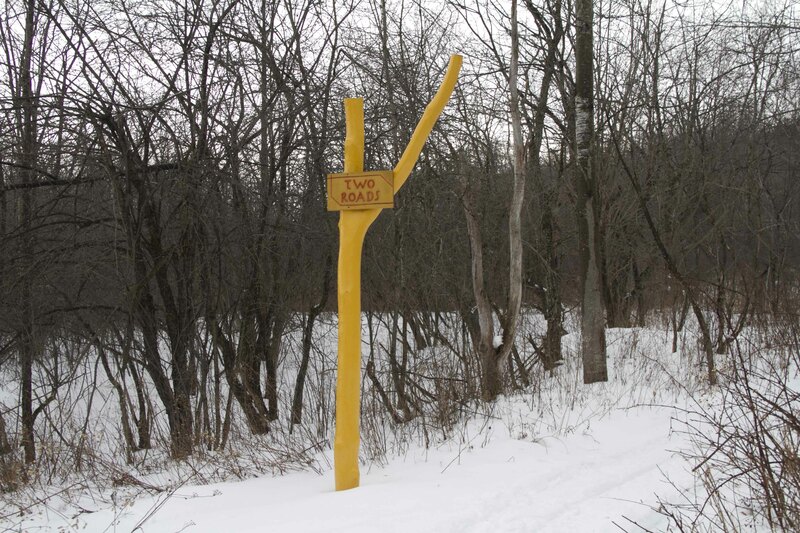 I used them on a sign affixed to a tree I painted yellow, at a spot where a trail through the woods divides. Why do you think I painted the tree yellow? …and then on the other. My son calls this the non-metaphoric bridge. Or the bridge that isn’t a metaphor. 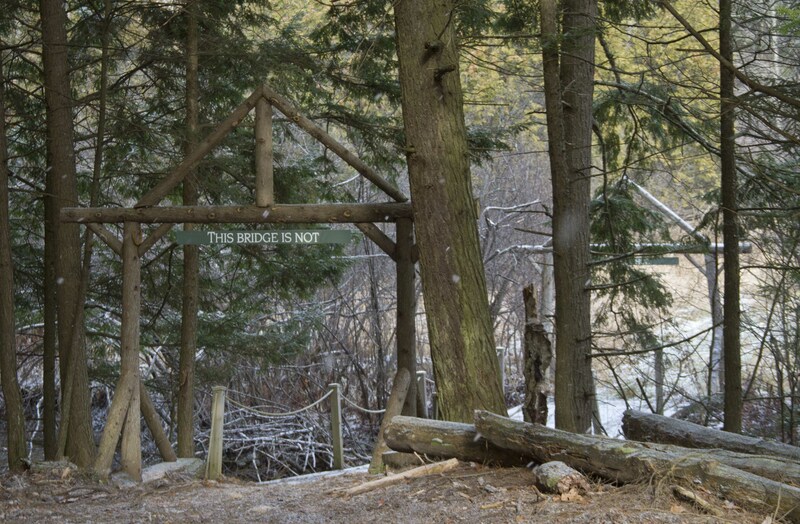 Or the bridge with the metaphoric signs. The inspiration for this most recent art project came from Broadwoodside, a garden in Scotland that I visited last year. Photographing our host pouring coffee, the words popped out at me, sending as clear a message as I’ve ever received. I knew immediately that this was an idea I would use. As soon as I saw this sign, I knew I would use the idea. But how? The idea grew over several months. 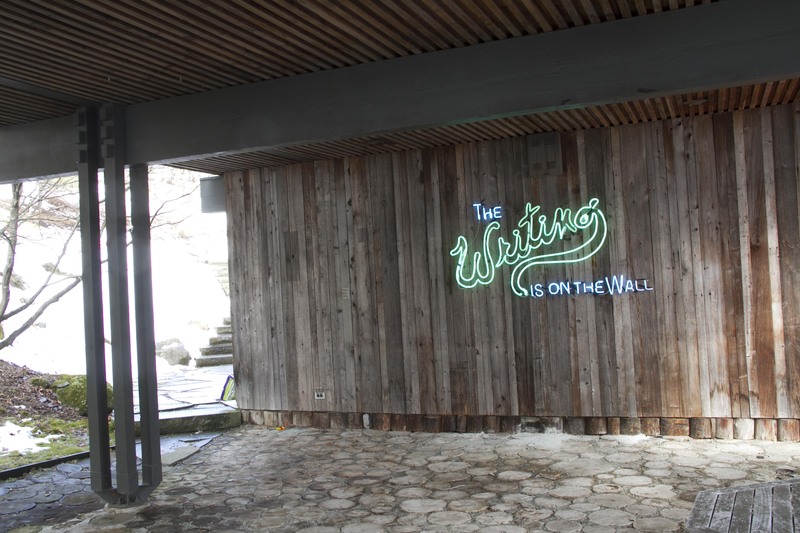 The Writing is on the Wall appears on the wall of our house, at one end of the Log Terrace. (We call it this because of the circular slices of wood that make up the floor.) The barnboard wall was, for me, the obvious place to put the sign, for practical as well as aesthetic reasons. Electricity was readily available, the stretch of wall felt empty and the area was dark. Before: This shot of the Log Terrace shows the empty wall, just waiting for a sign to be installed. 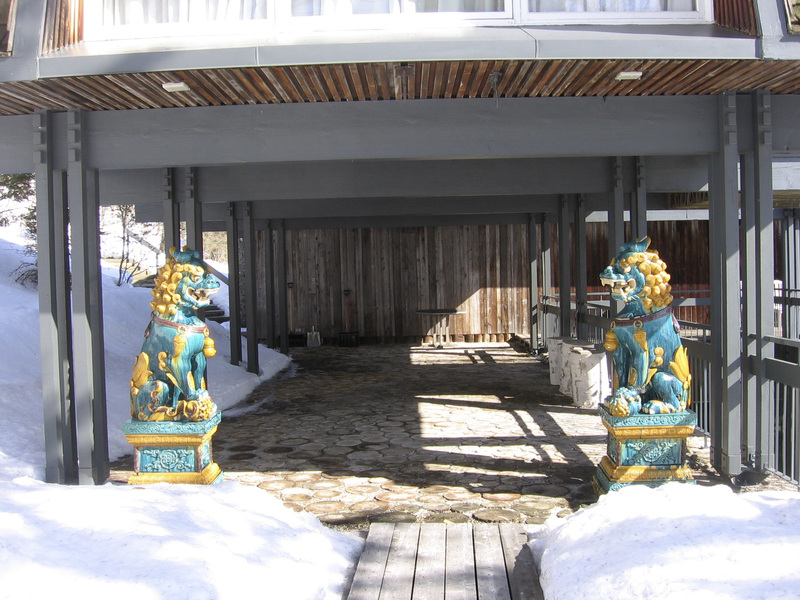 The Log Terrace is guarded by a pair of Chinese lion dogs we acquired when we lived in China many years ago. My sign isn’t a copy of the sign at Broadwoodside. It isn’t sending a Biblical warning. It’s a work derived from these and other sources, transformed by the material and style into something new. 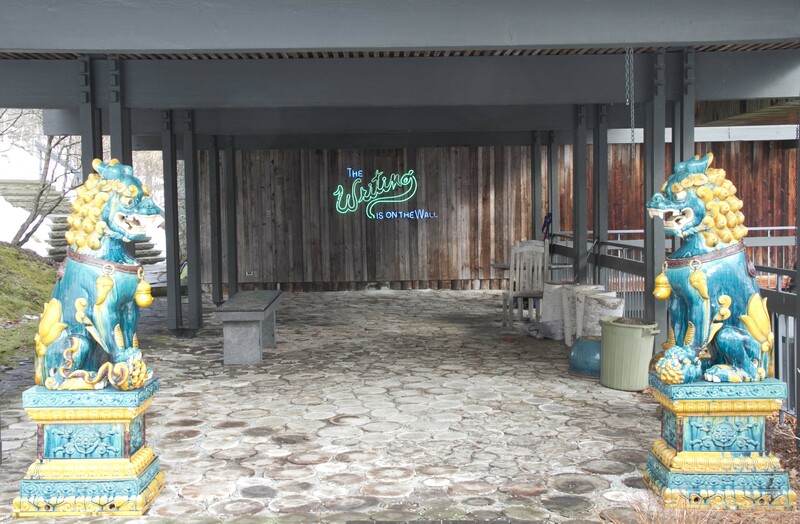 After: Even in daytime the neon sign lights up the space. And it makes the lions smile. Using words in the landscape intrigues me, and in the weeks to come I’ll be thinking about the topic in preparation for writing about it. That last shot — absolutely delightful with the lions echoing the color scheme of the neon! The piece makes me smile too, Pat, as does your non-metaphor bridge. I would love exploring your garden. Clearly, there’s much to discover. Thanks for your compliments, Pam. I was pleased with the colour echo between the lions and the neon. Getting colours that would do that was tricky — the selection was very limited. As for getting to Austin, there are so many US cities that I want to visit. Chicago and Austin are now top of the list. I’m delighted at the thought that I may have motivated someone to add words to their garden.We use words to communicate in so many ways, so why not outdoors? Keep me posted if you find a way to use them. Does it flash…….very jealous here? A flash of light but no animation. The idea appeals, though. I might need to add a hand moving across the word Writing, with the letters scrolling out one by one. Not sure either my neon man or the electrician is up to that challenge. I don’t know how many times I threatened to put up Rob’s Bar and Grill in lights (neon) at the cottage I did however put it up in LED back when I lived in Sydney. Which Sydney? Rob’s Bar and Grill at a cottage would get a lot of custom from me. Sydney here up island from Victoria on Vancouver Island. We were known to have a few parties back a bit; Will was a regular as most in the Hat……so much fun! 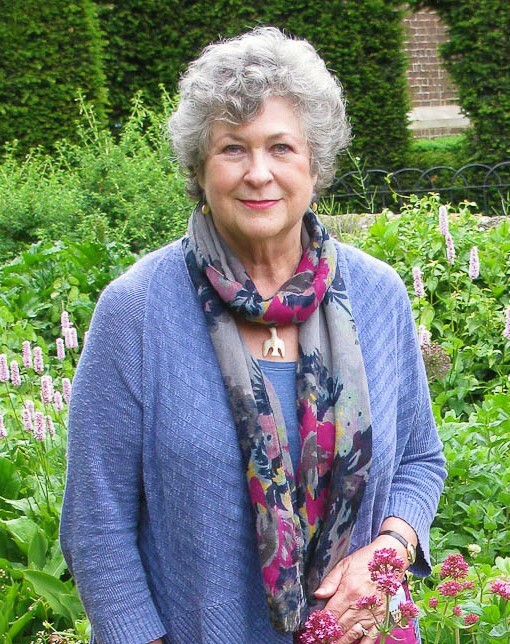 Pat, I don’t have any words in my garden — I suppose because the garden is where I want to connect with a pre-verbal sensuality. But I love the self-referential whimsy of your neon installation. Self-referential it is, for sure. And whimsical. You make me wonder if I need to pay more attention, though, to the pre-verbal side. I love the interplay of words and images. It’s one point in common with the art I’ve collected indoors. 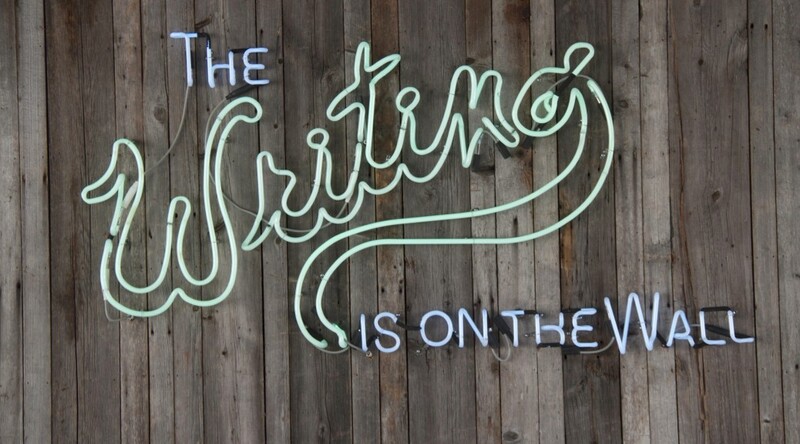 And I also have a great fondness for neon signs. So double applause from me! Thanks, Helen. The interplay of words and images is something I work at. Neon is a great material. Too bad power isn’t available in the forest…. I don’t use words in the garden, the thought has never come to me. I love your bridges though. Reminds me of an old nonsense joke: What’s the difference between a bridge? (Answer 1: One’s different. Answer 2: The farther, the fewer.) Were you tempted to use hebraized letters (might be hard to find in neon tubes) and a big finger as well? I’m planning a campaign to convince people that words outdoors add something special to a garden. Not having much luck so far… As for a big finger, writing or moving on, I can see places for it. But probably one neon is enough. I have a metal sign that says Inspire Happiness that lives in a pot year round. I also have funky door knobs screwed into my gates that say Enter and Exit. I like the absurdity of it because sometimes what seems like an exit is really an entrance. It’s all about perspective. I also have two signs made from old license plates that say I (heart) gardening and GROW. I love your sign and the tree circles. Words feel like a natural fit in a garden. I love the idea of the door knobs, Tammy! I’m surprised at how few people use words in the garden. Would you be willing to send me a photo of the Enter Exit knobs that I could use? I’m thinking about writing another blog post on the subject and am looking for examples. I’d clearly credit you on the post. I sent them to you via Facebook Messenger.